Are you suffering with chronic joint pain and hoping to avoid surgery? If so, you know how debilitating and disheartening it can be. You may have been to several physicians and specialists or even had surgery, just to be disappointed that you’re still in pain. The problem with chronic joint pain is that it can be caused by a variety of factors or a combination of factors, including normal wear-and-tear, prior injuries, infections, hormonal imbalances, autoimmune disorders, allergic reactions, exposure to environmental toxins, or even an emotional trauma. What can you expect when you visit the Kaplan Center? First, you will be seen by a physician who is trained in one or more of the following specialties: osteopathic medicine, pain management, family medicine, medical acupuncture and physical medicine and rehabilitation. Given that chronic joint pain has so many causes and contributing factors, this broad range of experience is crucial in accurately evaluating your condition and for ensuring that you receive the specific medical care you need to return you to optimal health. Second, your first appointment at the Kaplan Center will be at least 60 minutes long. Our physicians need this time to explore the onset of your condition, the specific nature of your pain sensations, and the overall status of your health, including prior injuries, surgeries, use of medications, travel history, exposure to environmental toxins, and social/family history. To gather additional information about your condition, your Kaplan physician may order specialized testing. 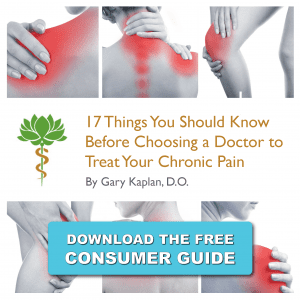 After reviewing all of the factors contributing to your particular health situation, your Kaplan physician will spend time talking with you about your diagnosis and working with you to create a customized and multi-dimensional treatment plan that addresses your symptoms and any possible underlying or co-existing conditions that may be causing or aggravating your joint pain.